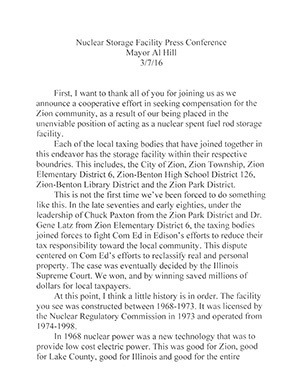 First, I want to thank all of you for joining us as we announced a cooperative effort in seeking compensation for the Zion community, as a result of our being placed in the unenviable position of acting as a nuclear spent fuel rod storage facility. Each of the local taxing bodies that have joined together in this endeavor has the storage facility within their respective boundaries. This includes, the City of Zion, Zion Township, Zion Elementary District 6, Zion – Benton High School District 126, Zion-Benton Library District and the Zion Park District. This is not the first time we’ve been forced to do something like this. In the late 70’s and 80’s, under the leadership of Chuck Paxton from the Zion Park District and Dr. Gene Latz from Zion Elementary District 6, the taxing bodies joined forces to fight Commonwealth Edison, and Edison’s efforts to reduce their tax responsibility toward the local communities. 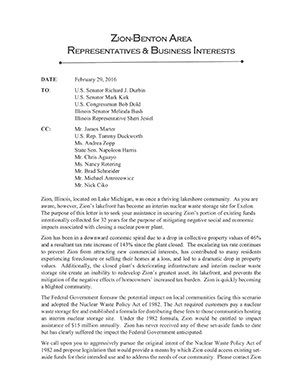 This dispute centered on Commonwealth Edison’s efforts to reclassify real and personal property. The case was eventually decided by the Illinois Supreme Court. We won, and by winning saved millions of dollars for local tax payers. At this point, I think a little history is in order. The facility you see behind me was constructed between 1968 and 1973. It was licensed by the Nuclear Regulatory Commission in 1973 and operated from 1974 to 1998. In 1968 nuclear power was the new technology that was to provide low-cost electric power. This was good for Zion, good for Lake County, good for Illinois and good for the entire country. The City of Zion cooperated with Commonwealth Edison in this exciting new adventure. 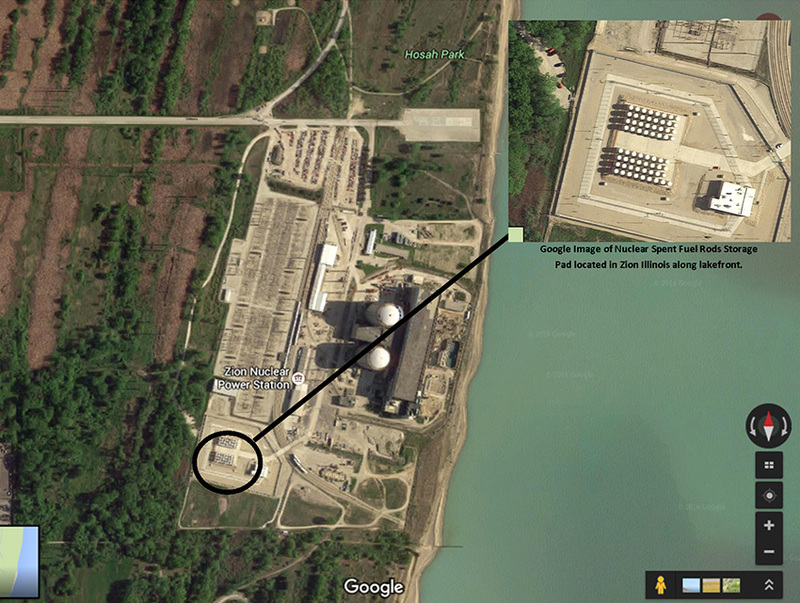 People of Zion understood that locating the power plant within the community and along the shores of our beautiful Lake Michigan, would entail some costs. There was an understanding that the community would give up over 400 acres of lakefront property, and understanding that there would be an eyesore on the lakefront that could never be hidden, and understanding that recreational access for visitors, as well as local citizens, would be severely inhibited, and understanding that economic development opportunities associated with the lakefront would also be severely inhibited. These are the same economic development opportunities that have been exploited by lakefront communities extending from Chicago to Milwaukee. In exchange for the cost, there was also an understanding that the Zion community would benefit from locating the power plant here. There was an understanding that Zion would benefit from the jobs created by the plant, an understanding that each taxing body would receive the significant tax dollars from the increased Equalized Assessed Valuation, an understanding that when the operating license of the plant expired, these 400 acres would be returned to the pristine condition in the property return for development purposes. That was the deal. Unwritten, but that was the deal. Now fast forward to today. There was never an understanding that once the plant closed, the Zion community would play host to a radioactive dump that contains 2.2 million pounds, and I’ll say that again, 2.2 million pounds of nuclear spent fuel rods. That was not part of the deal. I speak for all of us when I say that we do not want to be a storage facility for radioactive waste. So what’s to be done? Someone needs to either get the fuel rods out of here or compensate the community for becoming a de facto interim fuel storage facility. With the 2010 scuttling of the Yucca Mountain program, we are not naive enough to believe that the rods will be removed. We therefore believe we should be compensated. We also believe that the federal government should do the compensating. In 1982 Congress enacted the Nuclear Waste Policy Act which was intended to begin the process of disposing of nuclear waste. This part of the Act, a small fee was added to electric bills intended to pay for the disposal of spent fuel at nuclear power plants. The fee was small, one tenth of a cent for every kilowatt-hour generated at a nuclear plant, which totaled $.15 to $0.20 on an average monthly electric bill. Total up those tiny fees and you get a lot of money. By 2014 the fund had grown to $40 billion dollars with interest growing at $1.3 billion per year. The 1982 Nuclear Waste Policy Act contains a section entitled “Interim Storage Fund”. This section references “impact assistance” which says that, and I paraphrase, the Secretary shall make annual payments to a state or appropriate unit of local government, or both, in order to mitigate social or economic impacts occasioned by the establishment and subsequent operation of an interim storage capacity within the jurisdiction of boundaries of such government. Impact of systems could be as high as $15 per kilogram of spent fuel. Payments made to States and units of local government pursuant to this section shall be allocated in a fair and equitable manner with a priority to those states are units of local government suffering the most severe impacts. I can’t imagine any other units of local government, located anywhere in the country, that will suffer more severely then the Zion area communities. We’re talking about Lake Michigan lakefront property that is valued at a fraction of its fair market value because 2.2 million pounds of radioactive waste is stored on the shoreline. We understand the parts of the Nuclear Waste Policy Act do not apply at this date and time. However the intent of the 1982 federal legislation is clear….. That communities will suffer social and economic impacts if they are designated as interim storage facilities and that they should be compensated. We call on our state and federal legislators to assist us and do everything in their power to make the Zion communities whole, as we are a defacto interim storage facility. It is our hope that federal legislation can be proposed and adopted prior to October of 2016 during the second session of the 114th Congress. The last time the taxing bodies joined forces to protect the local taxpayers, we prevailed. Once again, we intend to prevail. With the assistance of our state and federal legislators, we feel our taxpayers will once again be protected for the long term. I want to both congratulate and thank all the officials of the taxing bodies that are supporting this effort. Our individual actions have been less than effective. I am confident that presenting a united front which represents thousands and thousands of voters, is our best course of action.